It might be a problem on my end, but I can't see any of the graphs. Brian: I know you've done much more complicated and technical analyses, but this is one of your best articles. Insightful, simple, intuitive, interesting. That last graph on 3rd & 10 is great. It'll be hard for anyone to read this and dismiss it, but I'm sure coaches will find a way. Making sound decisions based on mathematical models only helps you keeps your job as a coach if your team performs at or above the league average. Going w/ the flow allows for the use of age old excuses and a possible contract extention. How many of the runs on 3rd and 10 are QBs scrambling for the 1st on a broken play? I'm not sure off hand how your data works, if those are counted as passing because that's what was called, or running because that's what happened. Seems that the number of called runs would be low enough that QB scrambles would mess with the data quite a bit. 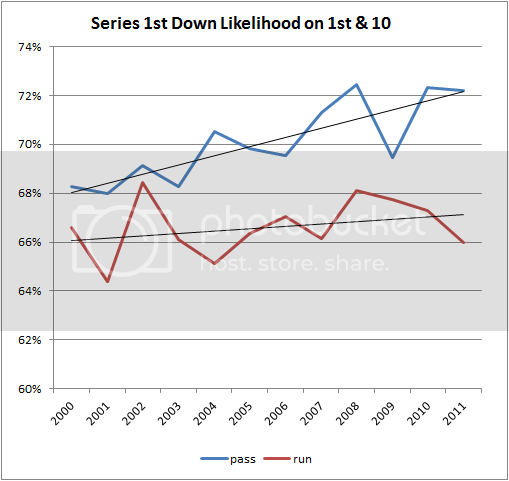 I assume the error bars on the run on third-and-ten would be pretty big. I'm trying to think about other things like what Dan noted - it's not as though teams are assigned to run or pass. It's a choice. It may simply be that choosing to run is a bad choice, but maybe teams that pass more are teams that have better quarterbacks and teams that run more are teams with bad quarterbacks. The connection between passing and success is interesting, and I'm fully prepared to accept the causal explanation - that coaches should run less - but causality doesn't fall out of these results automatically. If teams were less conservative on 4th down, wouldn't that make running on 1st and 2nd down more productive? I'll offer this counterpoint to the pass is better than run on 2nd & 10 or more: I would posit that a "safe" pass--in other words, a check-down/RB or WR screen/simple hook pattern by the TE etc. is as good of an option as a run, and maybe a better option than a "long" pass--in other words, anything past the sticks. (Understand, my idea would be any short pass where YAC are fairly normal--this gives the receiver a chance to make a play.) Now obviously, a completed pass or run past the sticks is the objective, and late in the game may be the "only" option that leads to winning. However, since Brian's graphs are for game theory purposes only, I'll stick with that. 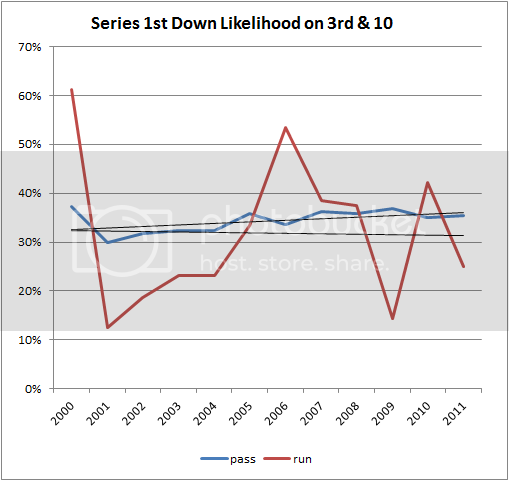 I'll also agree with Brian's previous post on this topic, and the commenter above--the more downs, the more running is a good option because passing is more volatile. 3rd and 10 conversion is roughly 0.33. Naively, that means we'd expect a 'play everything like 3rd and long' approach would give a conversion rate of 0.7 for 1st and 10. Oddly, that's better than what the teams produced in the first half of the 2000s. 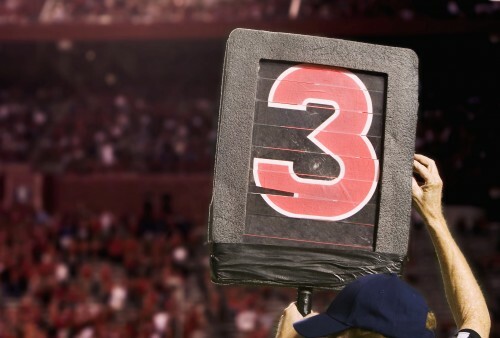 "One of the common defenses of a run-heavy offense is that offenses need to make their third downs “manageable,” meaning short enough so that conversion is easier." After you led off with this, I was hoping to see some kind of 2nd or 3rd down conversion rate by yards, and a discussion of what (besides moving the chains on 2nd) a 'manageable' 3rd down looks like. Why do people continue to try and apply saber-metrics to football? They simply don't work in any team performance sport. Teams are so completely different, and the minuscule sample size, make it so its almost completely useless to try and use saber-metrics to predict what and how they will perform. Its a completely different answer if I'm the Vikings with AP as my back and Ponder as my QB, versus if I was the old Colts, with Peyton Manning as my QB and Donald Brown as my back. Stop already. Sabermetrics helps tell you which way the wind is blowing. Of course, the situation is completely different for the Vikings and Manning-Colts. What sabermetrics is telling you is whether the wind is in your face or behind your back. In other words, the graphs here say that if you choose the run, you're going against the grain of probability. If you're the Vikings, you probably run anyway because you might be more effective running even when the other team expects it. These graphs help us find the strategic equilibrium point between passing and running. Yes, it will vary team to team, but it is important to understand these things in the general case. If nothing else, it helps you understand how much lost potential the Vikings have because they can't exploit a passing game's expected effect. Nice write up; Glad to have stumbled upon this site, will have to check back in more frequently. A few thoughts come to mind, having not thoroughly explored the site. 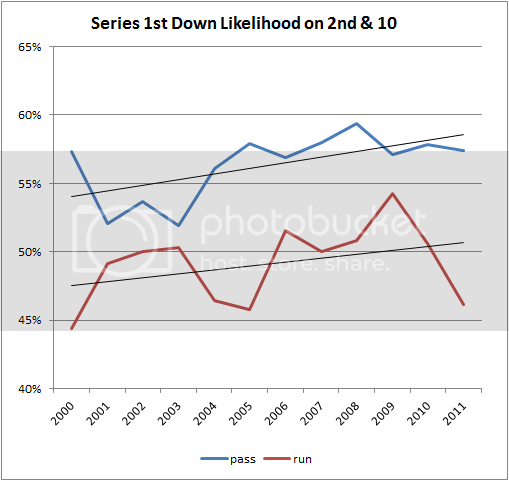 With regard to running versus passing on downs, I am wondering if people have established a Risk Premium that can be applied to running and passing. IOW, whats the reduction in Value of a given Play due to turnover (via interception or fumble) in Run vs. Pass, and how does that Value change on 1st, 2nd, 3d? Another thought, I do believe this type of analysis is worthwhile, against the one commentor's opinion. Some exploitable patterns come up through stats and that's what we are after. It can be helpful to your team if you evaluate your statistics to the league wide baseline. No question about it. That's basically how Options are traded.